Gastronomes of the world delight. Two new types of truffle have been unearthed in Thailand's far north, scientists announced Thursday in what they called a first for Southeast Asia. Researchers at Chiang Mai university said they had identified two brand new species and confirmed that tuber magnatum—the same species as Italy's much sought after white truffle—had been found in a national park surrounding Mount Suthep in northwestern Thailand. "We confirmed that they are truffles both from their DNA and their physical look," Jaturong Khamla, one of the researchers, told AFP following the publication of their paper. 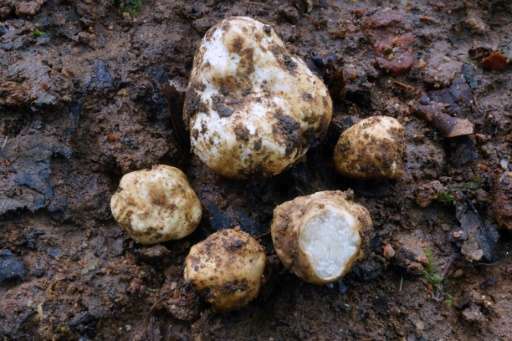 The first species, a white-coloured truffle, was discovered in 2014 and has been given the name tuber thailanddicum. The second one, brown on the outside but with a white interior, was found in 2015 and has been named tuber lannaense. Then in 2017 the team found another type of white truffle which DNA tests confirmed is the already known species tuber magnatum. While foodies may be salivating at the new discovery, Jaturong said his team were more preoccupied with confirming whether the truffles were new species than whether they tasted delicious. "The white truffle (thailanddicum) is similar to the Italian white truffle but they have a mild smell and are smaller," he said. Jaturong said his team specialised in fungi and had discovered around 60 types of new mushroom species in the last 18 years. But this was the first time they had identified truffles. "These are first truffles found in a tropical climate," a press release announcing the discovery said. Thailand's mountainous north often experiences cooler and wetter weather than the kind of year-round tropical heat experienced in the rest of the country—conditions more suitable for growing truffles.